For those of you who know me well..you know I am a basketball fan and you know that my home boys the San Antonio Spurs are inspiring enough... then you toss in one of my favorite online brands and then you have my attention! 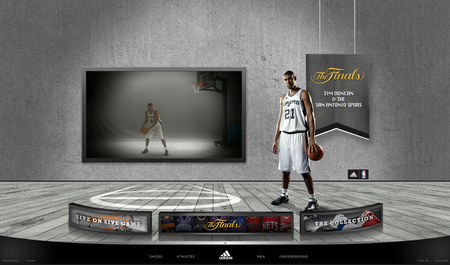 "Do You Believe in 5IVE" was the strategic platform from which the entire adidas basketball campaign came to life online for the 2006 to 2007 NBA Season. The campaign combined the global adidas basketball movement of working together as a team with the notion that NBA players need a strong team unit to succeed on the court. adidas has extended its campaign to a dedicated YouTube channel, driving online sales and reaching more than 2 million viewers. I love i because it features Tim Duncan the leader of a the quietest basketball dynasty ever. This is such an immense body of work, it would take too many words to comment on everything. From a high level, however, I feel the site and its iterations are all very polished. They are designed well, and while featuring five different players, all feel part of a larger body of work. The YouTube channel does social media right. It provides interesting content in the form of interviews and exclusive footage of the players outside of the studio and off the court. It provided a real benefit for visiting the site on a regular basis, and for the consummate basketball fan, the original footage would be a real draw. The wall of names of those who "Believe in 5ive" involves the audience, though I'm not sure how meaningful that interaction is. It looks like no expenses were spared on creating the videos, and it shows. They are awesome, and load and run surprisingly smooth on the site. This campaign was a success because it drove online sales and extending awareness virally. The combination of Social media, online advertising and rich sites gave the consumer a reason to go to the site play then buy! Click Here to see the Cannes review of creative. So the question is... Do You Believe in 5IVE?